VIRGINIA BEACH, Va. – May 1, 2018 – Cape Henry Associates (CHA) earned a spot on the Virginia Chamber of Commerce’s Fantastic 50 list of fastest growing businesses in the Commonwealth for a second straight year. CHA and fellow award winners were recognized at the 23rd annual Virginia’s Fantastic 50 Awards Banquet held at the Westfields Marriot in Chantilly April 26. Almost 450 participants from around Virginia attended. Virginia’s Fantastic 50 is a signature event of the Chamber and the only annual statewide award recognizing Virginia’s fastest growing businesses. 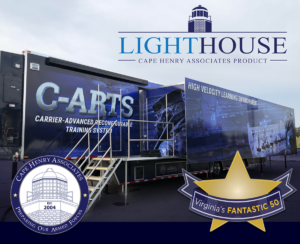 To be eligible, a company must be privately held with headquarters in Virginia, show revenues between $200,000 and $200 million, and demonstrate positive revenue growth and positive net income in its most recent fiscal year over the previous year. Companies are judged on a four-year revenue history. The professional service firm Dixon Hughes Goodman verifies all award entries.